DID YOU KNOW? 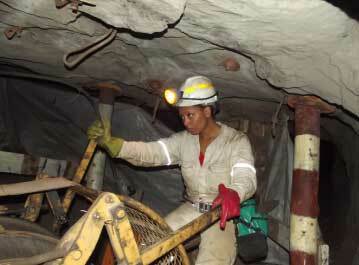 Mining communities have among the highest levels of gender-based violence in South Africa. According to research, one in five women older than 18 have experienced physical violence and one woman is killed every eight hours, making South Africa’s femicide rate five times higher than the global average. In mining areas, several factors converge to heighten the vulnerability of women and children to violence, including distortions in gender ratios, high levels of alcohol abuse and social and economic exclusion of women due to entrenched patriarchy. Hlanganisa Institute manages the Joint Gender Fund, a basket fund used to reach vulnerable women and children to end sexual, physical and emotional violence. The Fund seeks to enhance leadership and provide funding for innovative programmes that address the drivers of GBV and ensuring that women access health, social and legal services. Many mining organisations struggle to find high impact innovative programmes for their corporate social responsibility and social labour plans. Hlanganisa’s extensive experience in the sector ensures the selection of strategic programmes with high impact, high visibility and high return on investment. How can my organisation partner with the Joint Gender Fund to protect the women and children in my mining area? How does my organisation stand to benefit?